So much time is spent planning and executing your soap recipe. Don’t you want your packaging to reflect that? Your answer should be YES! Lisa Johnson, from Poppy Paperie, shows us some creative and inspiring examples of charming soap packaging over on her blog. Soaps were made with the Slim Square Mold, and Ice Cream Toy. Learn how to embed toys HERE on SoapQueen.TV. Soap was made with the Slim Square Mold with Hungarian Lavender and the rubber stamping technique. Learn how to Rubber Stamp your soap HERE on SoapQueen.TV. 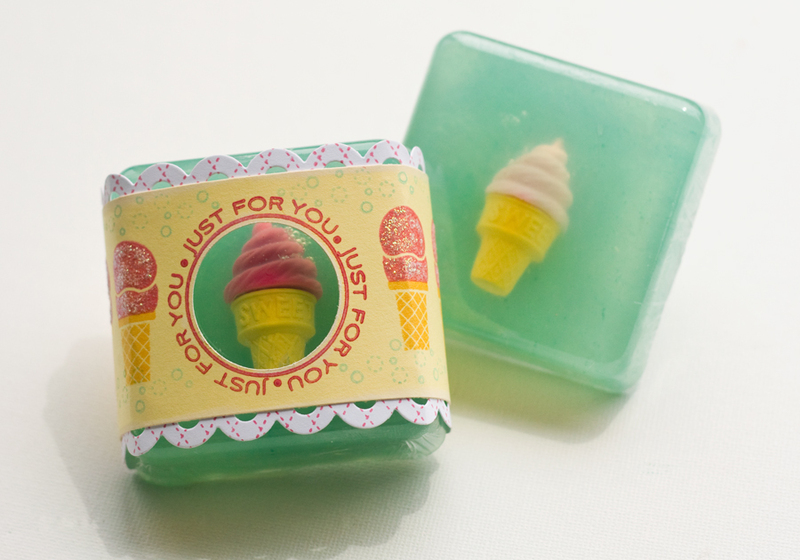 Made with the Soapylove IceCream Cone Mold and Mint Chocolate Chip Fragrance Oil. See Soapylove’s IceCream tutorial HERE. Gasp! I’m so impressed with Lisa’s soapmaking and packaging talent. 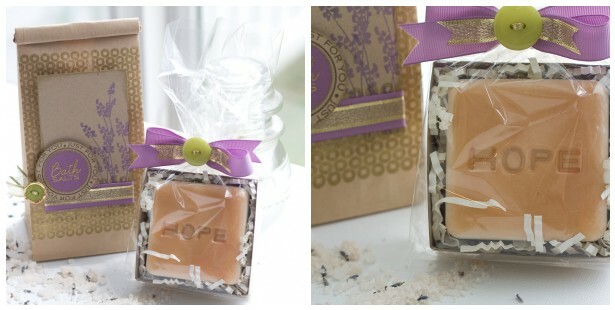 Check out Lisa’s Blog for a full tutorial on how to package your soaps like a rock star (Click HERE)! Make sure that you read all the way to the end of the Poppy Paperie blog post, you could have a chance to win a Bramble Berry gift certificate for $25! Good luck! Thanks Lisa; that’s high praise coming from you. Your blog post was adorable and absolutely quality. We were thrilled to be included. Thank you for the opportunity. PS – Yes, Erin does package very attractively. I’ve received her soaps and they are wonderful. This is impressive. Thanks. It’s a good thing you post this. It was a blast to plan out and stamp the packaging for these fun soaps. I love being a Stamper and illustrator… and now after making soap for the first time… I LOVE soap making! I’m so glad I included a Soap sentiment in my stamp set so that I would feel moved to dive in. THANK YOU! Not only are Bramble Berry products amazing… but the education you provide really support your customers as well as newbies like me! Easy, high quality and user friendly! I love every idea she came up with. It’s genius, all of it. Packaging matters – it really does (even though I want to believe that it’s only the product inside that counts, we do have to get people to actually pick up and buy the products to try). These ideas are so so cute! She definitely did your soap mold justice. I am bursting with cuteness pride. Gorgeous – love the mint chocolate chip. Oh my, gorgeous! Little works of art wrapped up in works of art! The packaging is amazing. So pretty, cute, and fun. Thank you for sharing! Exquisite packaging! Thanks for sharing- headed over to Lisa’s blog now! These packaging examples are just beautiful and elevate how one feels about the company behind them. Professionalism matters so much. Adorable packaging! I love it! How adorable! A little Window for the Ice cream Cone Eraser, and the box for the Ice Cream soap mold is absolutely awesome. I love how Lisa has blended her soapmaking with scrapbooking, way to go Lisa! These are ALL just too adorable, creative, and fun! I love the idea to leave a hole, so you can see the embedded eraser. So clever! Good packaging makes the product extra special, and Lisa certainly has a flare for it! Thanks for sharing her blog and work! Yum! I purchased some soap from Erin at Naiad Soap Arts and it came yesterday. Each bar was in a white gift box with a branded label affixed to one side so you could lift the label and see the soap without tearing the label. It also came with a sample of another soap (which I should have bought, dang!) in a pretty silk bag, and a handwritten thank you note. I felt special and it made buying entertaining and fun. Love that! Oh my god, I am dying from the cuteness!! Wow!! !